In our everyday life we interact with various information media, which present us with facts and opinions, supported with some evidence, based, usually, on condensed information extracted from data. It is common to communicate such condensed information in a visual form – a static or animated, preferably interactive, visualisation. For example, when we watch familiar weather programs on the TV, landscapes with cloud, rain and sun icons and numbers next to them quickly allow us to build a picture about the predicted weather pattern in a region. Playing sequences of such visualisations will easily communicate the dynamics of the weather pattern, based on the large amount of data collected by many thousands of climate sensors and monitors scattered across the globe and on weather satellites. These pictures are fine when one watches the weather on Friday to plan what to do on Sunday – after all if the patterns are wrong there are always alternative ways of enjoying a holiday. Professional decision making would be a rather different scenario. It will require weather forecasts at a high level of granularity and precision, and in real-time. Such requirements translate into requirements for high volume data collection, processing, mining, modelling and communicating the models quickly to the decision makers. Further, the requirements translate into high-performance computing with integrated efficient interactive visualisation. From practical point of view, if a weather pattern can not be depicted fast enough, then it has no value. Recognising the power of the human visual perception system and pattern recognition skills adds another twist to the requirements – data manipulations need to be completed at least an order of magnitude faster than real-time in order to combine them with a variety of highly interactive visualisations, allowing easy remapping of data attributes to the features of the visual metaphor, used to present the data. 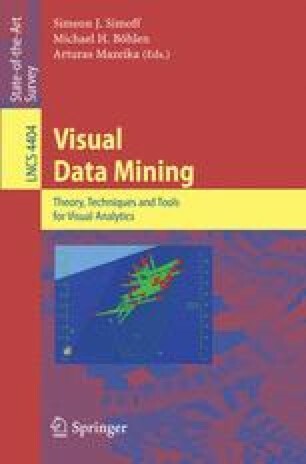 In this few steps in the weather domain, we have specified some requirements towards a visual data mining system.